Update! Voting has been extended to February 9th! This came about after feedback from the Brigades and the quick approval by the National Advisory Council. Sign up to run for a seat on the National Advisory Council by January 25th. During the fall of 2016, the Brigade community voted nine leaders into the National Advisory Council. In January 2017, the NAC set goals for the year, including establishing bottom-up governance, and getting a better sense of where the entire CfA Brigade community was at. The NAC also had a big hand in planning out our first Brigade Congress. With 2017 in the books, it’s time to select the next iteration of the National Advisory Council to help lead the civic tech movement. The Brigades are growing at a tremendous rate. Not just in terms of the number of cities, or the number of people who are scrubbed in, but in the maturation of the work that you’re doing. Part of that maturation is volunteer leaders taking ownership and taking part in helping to get this community to the next level. 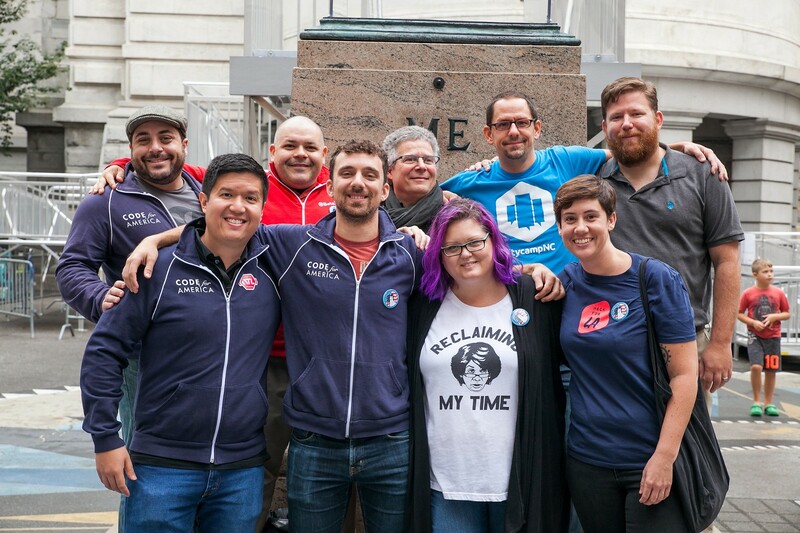 The National Advisory Council has done an important job in helping to connect Code for America to the needs of the Brigade community, and connecting the Brigade community to each other. The same skills that are useful in leading brigades — community organizing, managing projects, storytelling — are also useful in serving on the NAC. In addition to building skills, members of the NAC also have the opportunity to expand their network and form relationships around the country. We’re looking for leaders who are passionate about building a movement that brings together people to use their skills to help their communities, who recognize that America-sized problems need an America-sized response, and who recognize that we’re going to need to bring all kinds of different people to the table to make this work. We’re especially asking those who are underrepresented in technology to consider running for the National Advisory Council. We can not possibly hope to grow this movement to the level we need it to be unless we ensure that everyone is invited to the table. Feel that you aren’t qualified to run because you haven’t been doing this since the Brigade program started or aren’t a Brigade Captain? There are only so many people who do this kind of work and if you’ve been working to bring change in your community and have ideas of how the Brigade Network could be more effective — you should run! If you know of someone who should absolutely run, but they might need a nudge, submit a recommendation, and we’ll reach out to them. We’ll host an NAC Open Information Session on January 22nd to talk about what it’s like to serve on the NAC. You can RSVP for that information session here. This year, we’re introducing regional seats, with representatives from the Northeast, South, Midwest, and West. These regional seats will have two-year terms, and a special role in communicating and engaging with the Brigades in their region. The regional seats will be joined by 5 at large seats with a one-year term, who will focus on guiding and supporting specific areas of the Brigade program. West: Arizona, Colorado, Idaho, Montana, Nevada, New Mexico, Utah, Wyoming, Alaska, California, Hawaii, Oregon, Washington, American Samoa, Northern Mariana Islands, Guam, and all other US territories. In the future, all NAC terms will be two years with elections alternating between at-large and regional seats. Since we’re setting this up for the first time, the at-large seats will be one term just for this year. Candidates who are interested in running for a position on the NAC will be asked to answer questions about why they want to run and what they’ll do as a candidate. These answers will be published before the election starts so that Brigade volunteers will have a better idea of who is running. We’ll host an election forum on the first day of the election, January 29th, so that voters can ask questions. Your Brigade must be an official Brigade with a signed MOU by January 24th. If you’re not sure about this, check with your Brigade Captain. You can submit your candidate form here starting now! If you want to recommend others, you can do so here! Q: Can I run for both an at-large and regional seat? A: Yes. If you happen to win both seats, you will be asked to select one and the next runner up will fill the vacant seat. Q: Can two candidates from the same city be elected? A: Yes, the at-large seats have no geographical restrictions. Q: Do I have to be a Brigade Captain to run? A: No. Any member of a brigade is welcome to run. Q: Do I have to be formally “recommended” in order to run? Q: What’s the time commitment? A: Each member will commit to attend the monthly meeting which is an hour long, and requires approximately 30 minutes of prep. At the time new members are announced, Network Team staff will work with new NAC members to find the best time/dates for meetings. Each member will commit to two in-person meetings — normally around the time of Summit and the Brigade Congress. Travel will be paid for by Code for America. NAC members should expect to spend an additional 4 hours a month working with Brigades and the Brigade Staff at Code for America over email, slack and phone.